Stillwater, Oklahoma (TADIAS) – On Wednesday, June 18th, 2014, Oklahoma State University commemorated the 60th anniversary of a visit to their campus by Emperor Haile Selassie of Ethiopia. 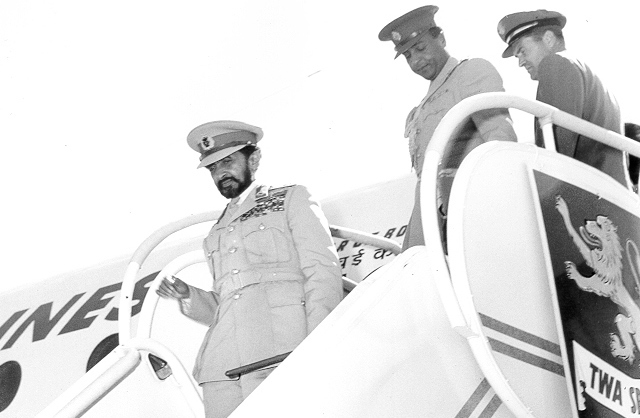 His Imperial Majesty was the first reigning foreign head of state to visit the state of Oklahoma. The Emperor brought a contingent of 19 persons with him to personally thank Oklahoma State University for their work in assisting Ethiopia in modernizing agriculture and education under the Point Four Program begun during U.S. President Harry S. Truman’s administration. The event was hosted by the School of International Studies at Oklahoma State University, headed by Vice President of OSU, Dr. David Henneberry. A wide and varied group of people, including historians, film makers, former Point Four in Ethiopia participants, university staffers, and Ethiopian, American and International students alike, came to the grand auditorium within the Wes Watkins Center for International Trade and Development to hear speakers talk about the significance of Emperor Haile Selassie and Ethiopia to Oklahoma and the U.S.
Presenters for the commemoration included Worede Gebremariam (President of the Ethiopian Student Association), Dr. Jack Herron Jr. (one of the first children of Oklahoma State University staff participants who built Jimma Agricultural and Technical School, now Jimma University), Dr. Ted Vestal (professor Emeritus of Political Science at OSU and a preeminent Ethiopia historian, author of “The Lion of Judah in the New World”), Dr. Barbara Stoecker (Regents Professor and Marilynn Thoma Chair of Nutritional Studies who has conducted research in Ethiopia for over 20 years), and Mel Tewahade (Director of the four part documentary series Point Four – Ethiopia, and another documentary Peace Corp – Ethiopia). Worede Gebremariam gave a fine presentation on facts and figures that provided a wonderful base of understanding about the country of Ethiopia. His charming personality and professional nature elicited laughter and brought forth well thought out questions about Ethiopia from the participating crowd. Dr. Jack Herron Jr. shared memories of what it was like to be a young teenager moving to Ethiopia with his parents who were undertaking a historically significant project to help Emperor Haile Selassie modernize his country through providing agricultural and technical assistance and learning directly to the people of Ethiopia. Dr. Herron’s father was one of the individuals responsible for establishing the agricultural extension programs that provide local farmers with an educated source of agricultural information for improving their farming techniques. Dr. Herron’s father was also responsible for starting the first 4-T Agricultural Youth Clubs modeled after the 4-H programs in the U.S. Dr. Herron described his time in Ethiopia as being magical, surrounded by beautiful and caring people and stunning natural beauty. He also remarked that the experience prepared him, and the other children of OSU staff, to have better understanding of people in general leading to above average success in their adult lives. Dr. Theodore Vestal, shared his immense knowledge of the life of Emperor Haile Selassie and gave the audience members detailed glimpses into the time period in which the Emperor visited the U.S. as a Foreign Head of State (a record 6 times only matched by the Queen of England later in the 2000’s). The visit of the Emperor to Stillwater, Oklahoma was the biggest event on record for the U.S. state, featuring a dinner and reception at the newly constructed OSU Student Union (at that time the largest Student Union in the United States if not the world). During the evening’s program the university’s president, Oliver Willham presented Haile Selassie with a scroll expressing respect and sincere admiration for the emperor and a bronze plaque given “on behalf of the citizens of Oklahoma,” commemorating Oklahoma State University’s successful program of technical assistance and economic cooperation. Today, that plaque is prominently displayed on the campus of Ethiopia’s Haramaya University. It is estimated that the Emperor graciously shook the hand of over 1,400 attendees at the event by the end of the evening. Dr. Barbara Stoecker informed the audience about her research which is conducted mainly in the Lake Hawassa region. Over the years, Stoecker has researched the role of micronutrients in child health in Thailand, China, Jordan, Iraq and Ethiopia. Most of her international work is in Ethiopia where she has taught, developed curriculum and helped numerous Ethiopian graduate students secure funding to attend OSU. In 2007, the Hawassa University launched Ethiopia’s first graduate program in applied human nutrition thanks to Stoecker’s instrumental work. Dr. Stoecker revealed that infant mortality rates have improved dramatically over her 2 decades of research even though more work needs to be done. Dr. Stoecker also remarked on how nice and gracious the people of Ethiopia are and what a delight it is to work with them. Mel Tewahade, Director of the Point Four – Ethiopia documentary series, gave a history of the Emperor’s life from the time of a youngster to his ouster and assassination by communist thugs. Mr. Tewahade shared his opinions of current world events and warned participants to not be lax in dealing with extremists who bare no good will to the world and will only provide chaos and suffering. Mr. Tewahade later generously donated a copy of one segment of the documentary to all who were in attendance at the luncheon given after the presentations. Dr. David Henneberry both began the day’s events and provided closing commentary. He highlighted that the financial commitment made by the Emperor in the 1950’s and 1960’s would have been the equivalent of a 270 million dollar educational program today in inflation adjusted U.S. dollars. There are few, if any, educational programs begun today, with this large of financial commitment, not to mention the man hours and love and caring that were given by the OSU-Point Four staff and Ethiopian officials. Dr. Henneberry was proud to point out that OSU has 4 students currently planning to begin study abroad programs in Ethiopia in the near future. He also noted the year after year dedication of Ethiopian students to attend Oklahoma State University and OSU’s dedication to providing them a world class education. In 2013, President Burns Hargis of Oklahoma State University met with University Presidents from Addis Ababa University, University of Mekelle, University of Bahir Dar, University of Axum, University of Gonder, University of Hawassa, University of Jimma, University of Haramaya and University of Adigrat. In conclusion, Dr. Henneberry stated that although the economic and political landscape has changed dramatically over the years, OSU and its Ethiopian partner universities continue to find new ways of working together to have a positive impact on their countries and the world. Of special significance at the commemoration, it was learned that the great-granddaughter of Dr. William G. Bennett, former Oklahoma A&M University (now OSU) President and first Director of the Point Four Program, was in attendance. She shared with the audience stories told her about the time when Dr. Bennett and Emperor Haile Selassie first met at an International Food Exhibition in 1945 and the deep regard Dr. Bennett had for the leader of a free country that withstood external turmoil while reminded the world of what types of actions were noble and right to pursue in the name of Freedom and Justice.